Students are taught how to form a proper image of what they read. 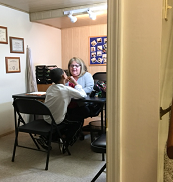 Our program adds the element of teaching the brain to form a proper image from what the student hears or reads. The student is then trained to use this image to remember what is expressed and also to incorporate the HOTS or higher order thinking skills necessary for complete reading comprehension. This is a method that is very different from the standard teaching of reading comprehension that uses a series of reading material with questions. For some students, repetition of this standard approach works, however, the student that struggles with making a proper picture to be used for reading comprehension is unable to obtain the necessary skills so crucial for good comprehension. Repeated effort of the same standard approach creates frustration for this child. 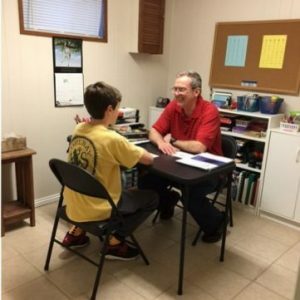 Our reading comprehension program is administered by licensed private reading tutors using specific one-on-one interactive exercises that are customized to fit the specific needs of each student. The success of our program lies in its ability to teach and apply the concepts of gestalt imaging. Gestalt is the concept that the whole or complete picture is greater than the sum of its parts. It is this whole picture that enables a student to understand and apply the material as opposed to the student who focuses only on the details but has little or no understanding of what they have read. Other benefits include improved writing and better verbal expression. To our delight, many parents have shared with us that their children are also displaying improved communication and social skills as a result of the program. reader who remembers and enjoys what they read.